Six O'Clock On The Swatch Watch, 20 Years Later : Blog Of The Nation Wristwatches went the way of the dinosaur when cell phones took over as timepieces. Or did they? Turns out the T-Rex — or rather, Timex — is making a comeback, along with Rolex, Swatch, Seiko and Casio. A collection of vintage watches. The incredible proliferation of cell phones relegated watches as timepieces to the backs of drawers and bottoms of jewelry boxes, forgotten relics of a pre-"can you hear me now" age. Ask someone what time it is, and rather than lifting and turning a wrist, he's more likely to pat his pockets or reach into her purse. But according to the New York Times, watches are making a comeback. 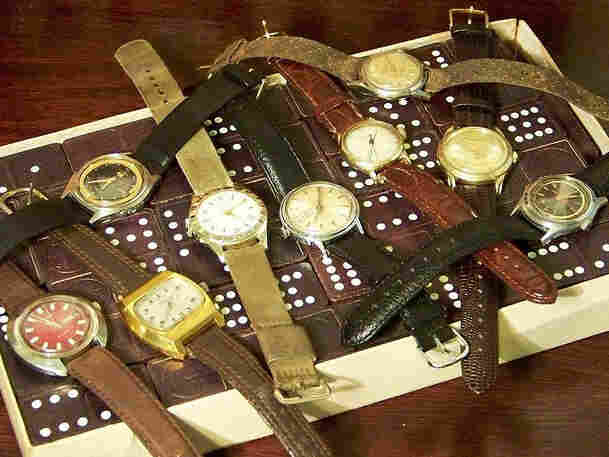 Much of the story focuses on an elite group of tastemakers who covet especially precious, vintage wristwatches. They value the mechanics of the little machines, their styles and pedigrees. But reporter Alex Williams' got some numbers to back up his report. After plunging 35 percent in 2008, and another 13 percent in 2009, sales of moderately priced watches (between $150 and $1,000) have rebounded and are up 15 percent for the last three months, compared with the same period last year, according to Fred Levin, the president of LGI Network, a market research company that tracks the industry. So what do you think? Bogus trend story about a precocious few, or a true swing? Are you telling time with a watch these days... or just wearing one because it looks cool?